Eastern Screech-owls are small owls reaching 16 to 25 cm in length, about the size of a robin Like in other owls females are larger than males. Like the great horned-owl, they also have ear tuffs. They are also dichromatic. This means they come in two different color morphs, red or gray. 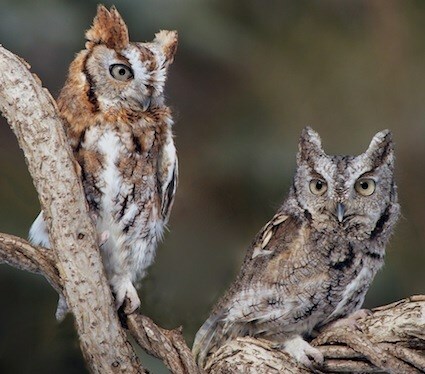 Eastern Screech-owls favor mixed woods, so the two morphs help the owls to blend in with different color bark. This being said when it comes to habitat the Eastern Screech-owl is the most diverse of all the North American owls. There distribution ranges from the Rocky Mountains to the Atlantic Coast and Florida and southern Texas to southern Canada. They can be found in virtually all kinds of habitats below 1500 meters, from woodlands to urban areas. They are a cavity nester and will use nest boxes or natural cavities to build nest. Despite their name Screech-owls don’t screech. They make trills, whinnies, and whistles. Eastern Screech-owls can live up to 10-14 years in the wild. In captivity they can reach ages of around 20 years. Their diet consist of insects, like moths and katydids, crayfish, earthworms, amphibians, reptiles, small mammals, like mice and bats, and small birds. It’s been known that the Screech-owls will live with Acrobat ants in their nest. The ants do not harm the owls but will protect the nest if any predators arrive by spraying irritating liquids and biting.